It turns out a lot of people would, particularly those who want a little competition, some camaraderie and a break from their normal routines. The Smart Cities San Diego Hackathon drew more than 60 people to the CyberTech co-working space on the evening of June 22. Their work stretched into the wee hours of June 23 and into early afternoon. The object of the 19-hour marathon was to create apps from data generated by the city of San Diego’s new streetlight-based sensor system. The sensors being deployed in 3,200 locations around the city will show the presence of pedestrians, auto traffic and the availability of parking meters in real time. GE’s smart city business, called Current, is providing the underlying technology. Participants in the Startup Week event were after $3,500 in prizes. “They are all pumped up,” said Justine Chen, a GE representative from the San Francisco Bay Area. The CyberTech coworking space, which is a rabbit warren of small offices and group spaces on Bankers Hill, housed scores of people Thursday night. Most huddled with laptop computers and spoke in low voices. “We might need a ‘show map’ button,” one coder said to another. On a coffee table, left over from dinner, was a plate with a few stray spaghetti noodles and dried pasta sauce. A tennis match played on the TV in the kitchen. The event found three software engineers from the U.S. Navy’s information technology command, SPAWAR, taking part in the competition. They were developing an app “for the tourist who comes into town and hasn’t made any plans,” said Minh Huynh, who shared a table with Jeremy Jung and Theresa Danh. They planned to use a database of events with real-time information on pedestrian presence and available parking places. The all-night hackathon has become part of software-writing culture, and it’s a definitely team sport. Jennifer Oki, who works as a research associate at the Salk Institute, was in another room building one of the more ambitious apps. Veteran computer architect Alex Dore and UC San Diego senior Sikandar Bangash explained the concept. One aspect of the app, dubbed “I’m Not Lazy,” encouraged motorists to park up to 10 blocks away from their destinations. Doing so would earn them points for relieving traffic congestion. The points could be redeemed for prizes, such as free parking, later. Bangash said the group was trying to “eliminate hypoxic situations,” falling back on vocabulary from his field of study, biomedical engineering. Other team members were Harshal Agarwal of Qualcomm Inc., Victor Hugo of UC San Diego and Tony Rivas of Measurabl, a small software company. Eleven-thirty was a big event at the hackathon. “Snacks!” one person exclaimed. Two big bowls of tortilla chips and salsa arrived, along with a big bowl of Goldfish crackers, a big bowl of nuts and some packaged string cheese on ice. A plate of chocolate chip cookies disappeared faster than a parking space in the Gaslamp on a Saturday night. Of course, there was a big pot of coffee at the ready. Jamie Daniels, events manager at CyberTech, said she expected three hours’ sleep at best. It was up to her to feed the crowd, and her next task was to get breakfast sandwiches and orange juice together for the 7 a.m. break. A group of about 10 students from the Sabio coding boot camp in Newport Beach showed up with an ice chest full of Red Bull and Monster energy drinks. The hackathon was to be a final project before graduation. The Orange County contingent broke itself into two teams, each working on a different app that leveraged parking data. The group included Christopher Rodriguez of Santa Ana, a U.S. Marine Corps veteran who served in Jordan and was now going to school on the G.I. Bill. 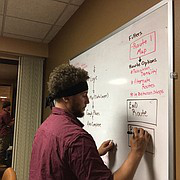 Rodgriguez, who looked more like a young Bob Dylan than a fighting man, said he was learning to write code because “this field’s blowing up.” The coding boot camp has been a “huge learning experience” and good way to get a sense of the civilian work environment, he added. The students’ instructor, Victor Campos, recalled an all-night coding job he had as a junior programmer in 1994. It wasn’t planned. At the time he worked for a furniture manufacturer in East Los Angeles. Their home-built accounting, inventory and payroll system crashed, and Campos worked Friday, Saturday and Sunday to bring it back to life, getting four hours’ sleep both nights. A certain amount of struggle brings understanding, Campos said. “It was the weekend that I [finally] understood programming,” he said.